Want $50k Scholarship? 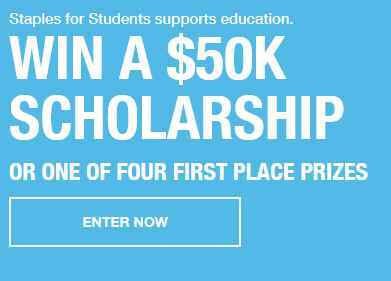 Enter the Staples for Students Sweepstakes now by entering entry code at staplesforstudents.com or staples.com/staplesforstudents for your chance to win $50,000 Scholarship or $25,000 Scholarship in the form of a check from Staples. How To Enter The Sweepstakes At Staplesforstudents.com? Make a purchase of at least $25 to receive one entry Code at participating location(Staples). Visit www.staples.com/staplesforstudents and Follow the online instructions to register by entering all information requested on the registration form. Once you filled out the entry form now Click on the submit button in order to enter this sweepstakes. Prizes: (“Grand Prize”) One lucky winner winner will receive $50,000 Scholarship in the form of a check co-payable to the winner and winner’s school and Four (4) First Prizes: four lucky winner will receive a $25,000 Scholarship each, awarded in the form of a check co-payable to each winner and each winner’s school. The AVR of each First Prize is $25,000 and The total ARV of all prizes is $150,000. Who’s Sponsor: This sweepstakes is sponsored by Staples the Office Superstore, LLC, 500 Staples Drive, Framingham, MA 01702.